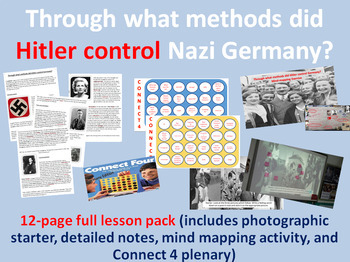 In this lesson students begin to explore the concept of totalitarianism by a class discussion of photographs of a 'much-loved' Hitler in the starter activity. This the leads to students accessing a detailed set of notes before beginning a mind map exercise in which the class explore the role of propaganda, economics, crushing of opposition and use of terror. Students conclude this lesson by participating in a Connect 4 style plenary to measure subject knowledge. I hope your students get as much out of this lesson as mine do.